Focus Mp3 Recorder Pro is easy to use and simple, but that's not to say it is not capable. The program can record audio, convert it and edit it. The supported formats are standard ones: WAV, MP3, WMA and OGG. The two most useful features are the splitter and the joiner, which let you cut and add content to a track. Focus Mp3 Recorder 5.0.1.1 is a shareware program and can be used as a demo to try the software until the free trial period has ended. A full version of the program is available after the trial period ends. For security reasons, you should also check out the Focus Mp3 Recorder download at LO4D.com which includes virus and malware tests. Additional screenshots of this application download may be available, too. Our editors provide some reviews of both freeware and paid sound and audio recorders, primarily for home users and businesses running the Windows operating system. All downloads are offered for free. 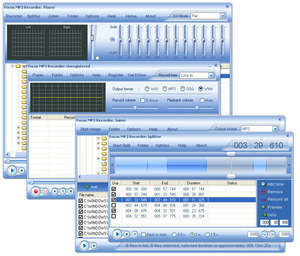 Check out some of the freeware downloads available in the sound recorder category. They contain no strings and are available at zero cost.